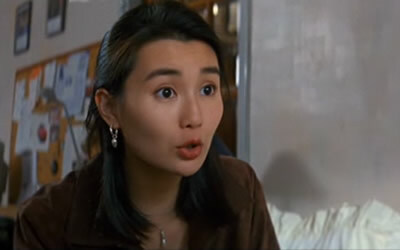 The following is an ongoing series about the prolific work of actress Maggie Cheung. For pure fetishism, I'm pretty sure Maggie Cheung's performance in Olivier Assayas' "Irma Vep" will linger in the favorable minds of fans for a very long time. Not only does she mostly slink around in a body-forming black latex outfit, but her often vacant look and malleable presence signify some sort of human living doll complex within the viewer. Of course, the film wants that to be the point as its a meta-meta look at filmmaking, updating old classics and the irreversible collision of creative minds figuring their craft out as they go along. But, as for Maggie herself, she gives an incredible performance as the "living doll", always ready to take direction or simply observe the cast and fellow crew as they stumble through their remake of Louis Feuillade's "Les Vampires" series. Serving as the real international calling card for director Assayas (whom Maggie would eventually marry for several years in 1998) "Irma Vep" also set Maggie up for more widespread recognition here in the States as the film was both a critical and art house success. First off, I'm not recommending "Millionaire Cop" to anyone besides the most dedicated Cheung fan. It's an awful film... schizophrenic in mood (a comedy, a supernatural thriller, a musical?) and plotting, it takes all one's strength just to stay with it. The plot- concerning a cop who goes undercover with a look alike rich businessman to prevent his kidnapping- certainly loses something in translation. Only available from someone's worn out Chinese VHS copy (complete with blue screen stoppage for about 2 seconds in the middle!) the English subtitles are negligent at best. Regardless of all that, "Millionaire Cop" does feature a fetching performance by Cheung as the girlfriend of the businessman ultimately charmed by this new personality. The third film in Jackie Chan's ultra successful "Police Story" trilogy is gloriously exuberant in its action sequences (helicopters versus trains, Rambo style jungle explosions etc.) but amiss in its usage of Cheung. Cauterized to only a few scenes, including a poolside resort setting that devolves into a keystone cops routine of physical comedy that remains the best portion of the film, this is all Jackie Chan all the time. Fairing better on the feminist side, though, is Michelle Yeoh as Chan's partner who gets just as many (if not better) choreographed fight sequences. Still, it needs to be seen for a Cheung completest. And my vote for stunt performer double goes to whomever took the Maggie Cheung fall from a helicopter onto the hood of a car and then onto the street. It looked like they missed their mark and it really, really hurt.